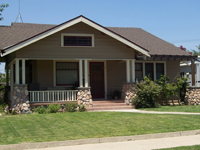 At Dovetail we love Craftsman style architecture. Sometimes called Bungalow or Arts and Crafts, these are the simple, solid homes built in the early twentieth century for America’s middle class families. You can find them on the established, tree-lined streets at the cores of most Central California communities. With their generous front porches they are designed for outdoor living. Their abundant windows bring in the fresh breezes and blur the lines between indoors and out. Natural stone pillars often support the large porch overhang. Indoor trim and wainscoting is frequently finished with a natural stain to show the original wood grain. The beauty of God’s creation is reflected in the way the materials come together. We love the simplicity and unfussiness of the Craftsman style. Efficient and compact floor plans make the most of the space available. Built-in china hutches, window seats, and piano nooks show an attention to comfort and livability as well as efficiency. Paneled doors, wide trims and wood flooring make these homes warm and inviting. All these features come together beautifully to give the Craftsman home an aura of peace and tranquility. On the other hand, the Craftsman home was designed to meet the needs of a different era. At the turn of the last century the saying was, “The hearth is the heart of the home.” The true center of today’s home is the kitchen. When these homes were built, a family of 6 could be content with sharing a single small bath. In our time it’s hard for even two family members to share a bathroom. In today’s world, simply restoring a Craftsman home to its original design doesn’t create a practical and functional living space. Livability is one of the primary reasons people want to remodel. Our challenge is to update the home in a way that suits the family’s lifestyle while remaining true to its original style—all within a budget. Our specialty is finding creative ways to apply the Craftsman philosophy to a design that fits the way people live. Our extensive library of Craftsman books can help homeowners envision the possibilities for their own homes as we work together to create a design that is both functional and beautiful. Whether a project is in the Craftsman or any other architectural style, the Craftsman values of quality construction, efficiency, durability and livability are integral to all our design and construction work.